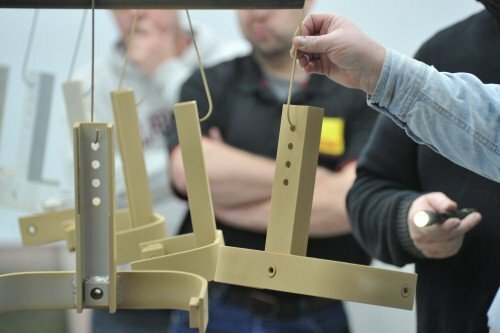 Want to get the absolute best finish possible when powder coating? Whether you just invested in a new coating system or you want to improve the performance of your existing powder spray booth and powder gun, here are five great tips to help you get the most out of your equipment and improve your finish quality. Fresh powder should be fluffy and without clumps. Storing powder in areas that are hot and humid can quickly cause the powder to become moist and clotted, so find a way to keep your powder dry and relatively cool. Reclose open powder containers promptly to prevent contamination. If you have a good ground and your gun is set up properly, you shouldn’t have a bunch of powder hitting the floor while you spray. Remember, all powders are not created equal! While all powders have a certain amount of inert filler material, inexpensive powders often have much more of it. Just because a powder costs less doesn’t mean it is the best value. If you want better finishes, buy the best powder you can afford and take care of it. Keep your powder spray booth’s light fixtures clean and keep them supplied with fresh wide-spectrum bulbs that are designed for paint booth use. If you have bulbs that are burned out, replace them! It’s amazing how many shops have booths with light fixtures that are caked with powder. Instead of coaters working in light that is about the same quality as sunlight, they’re stuck spraying with green or red or blue light glaring out of fixtures that haven’t been cleaned in months. Problems can also happen in shops that use cheap bulbs that have a warm, off-white color that’s very unlike natural sunlight. Spend the money on wide-spectrum bulbs that have a high color temperature and mimic natural sunlight. This gives coaters a chance to more accurately assess and match colors. Keep the booth clean and the bulbs fresh so they can see fine details and turn out better quality work. If your filters are damaged or clogged, you won’t get good results from your powder spray booth. Almost all booths work on the same principle—air is drawn into the booth from the shop, travels across the part, goes into filters, and then is either returned to the shop or discharged into the outside environment. When filters begin to clog, they put more stress on the exhaust fan. The fan doesn’t perform as well, and less air moves through the booth. This can cause problems with visibility inside the booth and can impact the quality of the finish being applied. Damaged filters can cause the airflow through the booth to change unpredictably. They are often the result of improper handling or poor maintenance. Once the booth’s filters are damaged, you’ll probably end up having to clean the booth’s exhaust system from one end to the other to prevent an on-going problem. Reliant’s recommended filter change schedule will help you keep your powder spray booth in the best shape. A) The blanket filter is the first line of defense and usually lasts between 3 days and 2 weeks. This filter media is very inexpensive. As a general rule, trying to vacuum and reuse the filter is unwise. IMPORTANT: Never spray the blanket filter with compressed air in an attempt to dislodge powder trapped in it—you’ll damage the filter and ruin the other filters in the booth if you try to reuse it! Just cut off a new section of filter and replace it once it is clogged. B) The cube-shaped bag filters are located directly behind the blanket filter. Depending on how often you use the powder spray booth, you’ll typically need to change the bag filters once every 2-4 months. They can collect up to several pounds of powder, which will make them distort and stop working properly. Make sure to service them before the wire frames inside them warp and powder begins to go around them and directly into the HEPA filters! You can vacuum out the bag filters to extend their service life, but remember to take them out of the booth first. We recommend that whenever you replace the blanket filter that you remove, clean and then rotate the bag filters 90° before reinstalling them. This serves to even out the wear and will significantly increase the life of the filters. IMPORTANT: Never spray the bag filters with compressed air in an attempt to dislodge powder trapped in them—you’ll damage the filters and ruin the HEPA filters in the booth if you try to reuse them! C) The HEPA filters are the last filtration step before venting the booth’s exhaust back into the shop environment. If your other filters have been cleaned regularly, the HEPA filters should last about 1,000 hours – which works out to anywhere from 6 months to a year and a half in most powder shops. These filters can’t effectively be vacuumed without damaging them. It is possible to gently tap a clogged filter’s frame while holding the filter with the intake side pointed down at the floor and dislodge a small amount of powder. This can be repeated a few times to extend the filter’s life slightly. IMPORTANT: Never spray the HEPA filters with compressed air in an attempt to dislodge powder trapped in them—you’ll ruin them instantly! A) The cartridge filters are typically cylindrical filters that have a pleated fibrous exterior. They are the first filtration step before venting the booth’s exhaust back into the shop environment, and they do the bulk of the work. All of Reliant’s cartridge systems use pulsed air cleaning to periodically discharge built up powder from the outside of the filters. If it has been set up and maintained properly, the cartridge filters should last 1,000 to 2,000 hours – which works out to anywhere from 6 months to three years in most powder shops. These filters can’t effectively be vacuumed without the risk of damaging them. Also, it is possible to accidentally damage cartridge filters by using compressed air that is dirty, oily or wet to supply the pulse cleaning nozzles. IMPORTANT: Never remove and spray the cartridge filters with compressed air in an attempt to dislodge powder trapped in them—you’ll probably damage them and you risk ruining the other filters in the system if you try to reuse them! B) The panel filters capture any dust that gets past the cartridge filters. They help assure that air being returned to the shop environment is clean and powder-free. Depending on how often you use the booth, you’ll typically need to change the panel filters once every 2-4 months. These filters are relatively inexpensive, and, as a general rule, trying to vacuum and reuse them is unwise. IMPORTANT: Never spray the panel filters with compressed air in an attempt to dislodge powder trapped in them—you’ll ruin them instantly! For more information on a Reliant powder spray booth, click here, or give us a call today. This entry was posted in News on February 25, 2016 by Reliant News.